California’s various education databases bring to mind that philosophical puzzle about the tree falling in a forest. The state has the ability to link the data systems and make them robust, but since there’s no political will to do that, how useful are they? Okay, perhaps that’s overstating the existential question, but it does keep California from even having a thoughtful conversation about the pros and cons of data sharing. So when the Data Quality Campaign yesterday released its seventh annual report on state education databases, California received mixed marks. The elements of a strong system are there, but they’re not backed up by action. 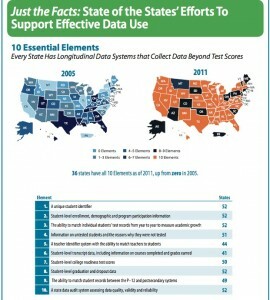 Increase in states meeting all elements of a good data system. (Source: Data Quality Campaign). Click to enlarge. Since the organization’s first survey in 2005, California has gone from meeting just one of the 10 Essential Elements of a data system, to a full sweep. Thirty-six states have met all the elements, which include giving each student a unique identifier and having access to students’ college readiness test scores, graduation and dropout rates, and transcript information showing each student’s classes and grades. Before Gov. 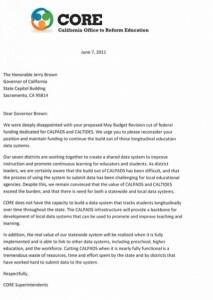 Brown’s veto last summer of CALTIDES, the statewide data system for teachers – which required Brown to return a $6 million federal grant to help build the database – the state had also met the second action item of creating stable, sustainable support for longitudinal data. At that time, California was on a path to developing two huge databases that could be linked. The other one is CALPADS, the California Longitudinal Pupil Achievement Data System, which is up and running, and recently published the state’s most accurate dropout and graduation rates. 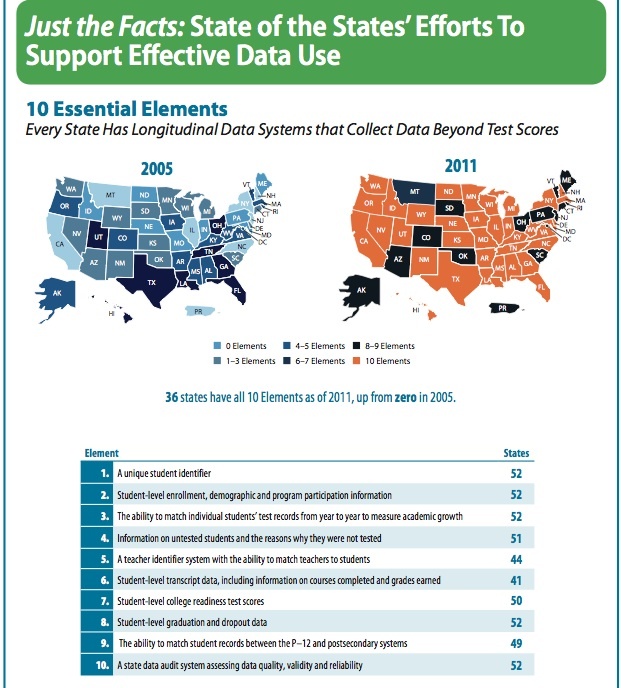 The state’s reluctance to pursue a more expansive data system validates the four barriers to using data described by DQC’s report: Turf, trust, technical challenges, and time. Trust is the biggest hurdle. School District, teachers meet weekly to review student work and test scores and use that information to modify lesson plans or provide more individualized instruction. Sacramento City is a member of the California Office to Reform Education, or CORE, a group of seven unified districts, including Los Angeles, Fresno, and Long Beach, that are working together to build a shared data system. But, in a letter to Gov. 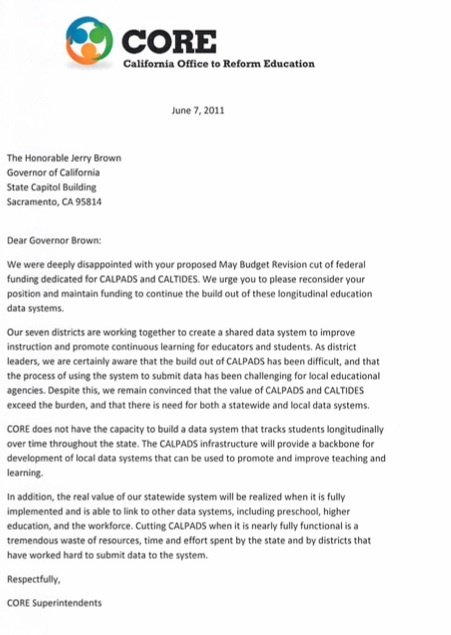 Brown last June, urging him not to cut funding for CALPADS and CALTIDES, the superintendents said there’s a limit to what local districts can do without a statewide foundation to support them. Brad Strong, the senior director of education policy with the advocacy group Children Now, said it’s also not feasible to expect all the state’s 1,000+ school districts to have the resources and technical know-how to build their own systems. What’s more, he said, local data systems alone couldn’t track a student who left a district to learn whether he dropped out or enrolled in another district, they couldn’t follow their graduates to see if they were prepared for college-level work, and they wouldn’t be able to analyze teacher preparation programs to determine which ones are doing the best job of developing highly qualified teachers.